It is intended that the book will be a practical guide to provide any reader with the basic information to help them understand what is necessary in order to produce a good barrier coated web or to improve the quality of any existing barrier product. After providing an introduction, where the terminology is outlined and some of the science is given (keeping the mathematics to a minimum), including barrier testing methods, the vacuum deposition process will be described. In theory a thin layer of metal or glass-like material should be enough to convert any polymer film into a perfect barrier material. The reality is that all barrier coatings have their performance limited by the defects in the coating. This book looks at the whole process from the source materials through to the post deposition handling of the coated material. This holistic view of the vacuum coating process provides a description of the common sources of defects and includes the possible methods of limiting the defects. This enables readers to decide where their development efforts and money can best be used to improve the barrier performance of their own process or materials. 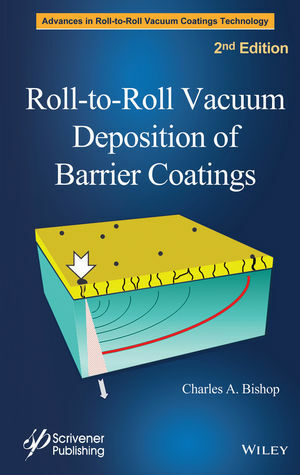 The 2nd edition contains at least 20% new material including additional barrier testing techniques that have been developed and testing and cleaning equipment brought to market since the 1st edition was published in 2010. The topic of adhesion is covered in more detail and there is a section on the Hanson Solubility Parameter which is a method of predicting the solubility of gases or liquids in materials. Charles Bishop left school at 16 to start an engineering apprenticeship completing it as a Toolmaker. Opting to return to education he took a degree in Materials Technology. Here the seeds of vacuum processing were sown in the form of a final year project working on bone implants. Moving to the Physics Department he went on to complete Masters and Doctorate degrees on different aspects of vacuum deposition. After a brief time as a post doctoral researcher he moved into industry for the next 15 years before setting up his own consultancy business in 1998. He is the author of the book Vacuum deposition onto webs, films and foils, 3rd edition and author or co-author of over 90 papers and 5 patents. He contributes a regular column in Converting Quarterly as well as technical articles. He was presented with a SVC Mentor Award in 2008. Currently he is the Editor of the Vacuum Web Coating blog that is accessed through www.convertingquarterly.com on behalf of AIMCAL as well as a regular lecturer at the AIMCAL Converting Schools and presenter of a number of Webinars also offered by AIMCAL.